Oral histories make up a substantial portion of our knowledge regarding the Forlorn Soldier. The earliest account of this statue asserted that designers mistakenly created it with the wrong foot forward. Years later, many thought the statue designed from a mirror image. The most recent account of the story promotes the idea of the soldier as “forlorn and forgotten.” Assembled here is a collection of interviews documenting the latest iteration of the soldier’s oral history. 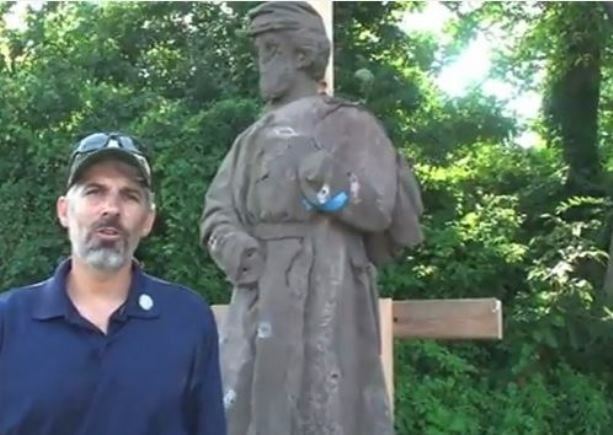 Some of the interviews include Peter G. Kelly, whose family members were the stewards of the monument for over a century, Matthew Warshauer, co-chair of the Civil War Commemoration Commission, and Francis Miller, proprietor of ConservArt, the company contracted to preserve and relocate the statue. “Almost Forgotten.” Hartford Courant. May 25, 1986, sec. H.
“Forgotten Sentinel.” The Travelers Beacon 2, no. 21 (August 1939): 6–7. “Taps for ‘Hayfoot.’” Hartford Courant. April 12, 1936. “The Lighter Side: Old Hayfoot.” Hartford Courant. August 20, 1936.